Black Friars station opened in 1870. One of the busiest, it has overground trains, the Thames link, and the tube all running through it. Closed for 3 years for major work on the Thames Link -the planned reopening is late 2011. The pedestrian subway is also being dollied up. When it is finished it will be the first station to span the Thames and you will be able to pop up from the underground either side of the river. You'll miss the wonderful river views going this way, but the bonus is that you won't get wet (or should that be saturated!) on a day like yesterday. However, the rain didn't deter the Morris Dancers from entertaining us (does anything?) 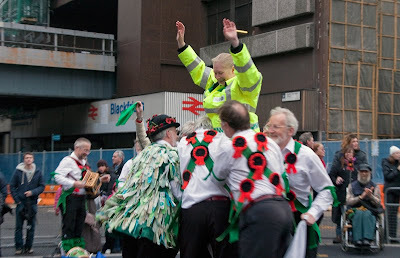 and throwing the St John's Ambulance woman into the air as part of their ritual in front of the station. tus fotos son muy bonitas ! I think you have more fun in London than perhaps anywhere else in the world. It seems as if they're always working on something or other on the London Underground! But I have to admit: they do dolly it up quite nice! No wonder if people think we English are dotty. My maiden name is Morris ,so I can imitate these hanky swinging gents anyday!